The first pneumatic tires were invented in 1888 by John Dunlap, a Scotsman who immediately applied the invention to the bicycle. 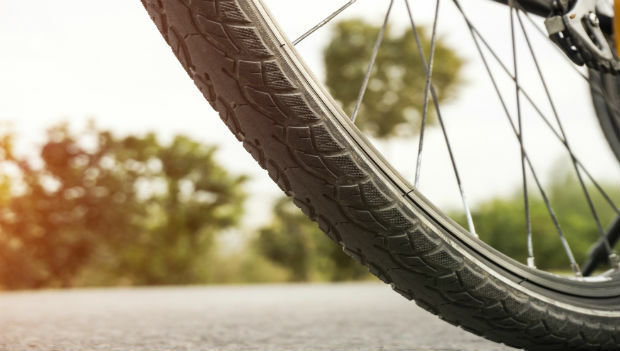 Dunlop found that bicycle tires containing inner tubes filled with air not only provided a smoother ride but also provided a 30-percent increase in efficiency over hard rubber tires. Bicycle tires inflated with air became common by 1900. Ever since, competitive cyclists have fretted over how to determine proper tire pressure. When putting air into your tires, it is a matter of critical importance that you never exceed the maximum pressure stamped on your tire's sidewall. Over-inflated tires can fail unexpectedly with tragic results. For this discussion, your baseline pressure should start at the stated maximum and work downward. A quality bicycle pump with a built-in pressure gauge will keep you honest. Knowing your tire maximum, your decision will always boil down to three considerations: tire width, rider weight and road surface condition. But how should you decide what pressure is best for you? Most 700c road tires today are sold in either 23- or 25-mm widths. While these sizes tend to show up at road events, wider tires are used for cyclocross, commuting and touring. Wider tires provide a larger cross-section when in contact with the road. Because of this, they can be filled with lower pressure, resulting in a smoother ride and better control. While some would point out that rolling resistance increases with tire width and lower pressures, there is a tradeoff. Lower rolling resistance at high pressures tends to create a harsh ride with less control. A fair amount of research has been done on rolling resistance. Generally speaking, if you maintain sufficient pressure to limit tire compression—also known as tire drop—to less than 15 percent of the uncompressed vertical cross section, you will not suffer significant decreases in rolling efficiency. To measure tire compression, place your bike by itself on a smooth, hard surface, such as concrete or tile floor, with your desired pressure in each tire. Measure the shortest distance from the bottom of the rim to the floor. This distance should measure a few centimeters in length. Next (you'll need an assistant for this part), sit on your bicycle and place your hands on the handlebar in normal riding position. Hold yourself upright with a chair or by placing your shoulder against the wall. Finally, for each wheel, divide the second measurement by the first measurement and multiply by 100. If both the front and rear are 85 or greater, you have sufficient pressure for efficient cycling. If not, adjust your pressure accordingly and be careful not to exceed your tire maximum. Heavier riders require higher pressures in the same size tire. For example, junior cyclists that weigh less than 100 pounds do well with no more than 80 pounds of pressure in both tires. Higher pressures for lightweight riders provide little benefit in rolling resistance while decreasing tire adhesion with the road surface. This can lead to energy-sapping frame vibration and cause poor cornering and handling on rough roads. Any detailed discussion of tire pressure should also take into consideration the quality and type of tire being used. A quality clincher with a higher thread count in the sidewall will result in a smoother ride at higher pressures. Sew-ups, or tubulars, tend to provide a smoother ride at similar pressures. Regardless of tire type used, be careful not to over pressure your tires. Too many times, I have seen riders experience catastrophic tire failure at a race because of over-inflated tires...apparently trying to gain that last bit of performance with the highest pressure. Over-inflated tires fail dramatically and often sound like a gunshot! A lower pressure will provide a smoother ride, better tire adhesion on the road and better control. We all dream of that mystical ride along a beautiful winding country road paved with new asphalt. Reality dictates that much of your riding will be on a variety of surfaces. Generally speaking, most riders use a slightly lower pressure on rough roads. With lower pressures, the tire deforms to the uneven surface and makes better contact with the road. This reduces vibration and provides better traction and control. A smooth surface, such as new pavement, will allow higher tire pressures and provide a fast and pleasant ride. Dirt or gravel roads dictate lower pressures on wider tires. Racers in the famed Paris Roubaix, for example, choose wider tires to accommodate both rough cobblestones and smooth pavement. Racers have been rumored to run 28-millimeter wide tires with as little as 50 pounds of pressure. Lastly, check your tire pressure regularly. You can do this by attaching your pump and checking the gauge without applying a pump stroke. Better yet, purchase a stand-alone pressure gauge from your local bike shop. Either way, paying closer attention to your tire pressure for the conditions at hand will lead to a more efficient and satisfying ride.